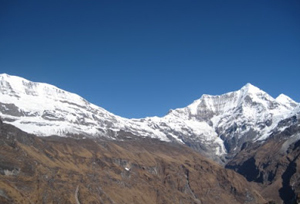 A trek into the lap of pristine nature can be the best description given for the Sunderdhunga Base Camp Trek. The virgin trails and the unexploited nature's beauty prepares an inviting ambiance for anyone who digs trekking and nature. 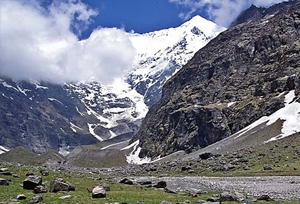 Sunderdhunga Base Camp is perched at an altitude of 4100m above sea level; it is a moderate trek, so one should expect to encounter lot of steep climbing and descents, winding trails, less habited villages and a few unknown tracks. However, this trekking expedition guarantees unprecedented adventure, views and experience. The trek for Sunderdhunga Base Camp begins from Loharkhet and further heads up to Khati (via Dhakuri), which is the last largest village near Pindari Glacier. The trekking trail of Sunderdhunga Base Camp is same till Pindari and from there it cuts towards other lesser explored route that leads to Kathalia and Jatoli. Passing through thick alpine forests and crossing and walking along rivers like Pindari and Saria one reaches Sunderdhunga Base Camp, where the reward is the panoramic view of majestic peaks like Tharkot (6,100 meters), Mrigthuni (6,856 meters), Maiktoil (6,803 meters) and Panwalidwar (6,663 meters). 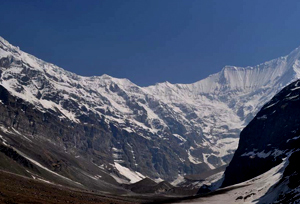 Here is the detailed itinerary for Sunderdhunga Base Camp Trek. On arrival at Delhi you will be received by our representative. Transfer to hotel for overnight stay. Today you need to wake up early as we will drive to Ranikhet via Kathgodam and Bhimtal. On arrival at Ranikhet by the evening check in to the hotel. Dinner and overnight stay at the hotel. Post breakfast drive to Loharkhet. Trekking will start from here and we will trek up to Dhakuri. Today's trek is 11 km long and it takes you down into the depths of the valley followed by a fair climb to Dhakuri. Dinner and overnight stay in tents/rest house. This is an 8 km trek. Khati is the largest village on the Sunderdhunga Base Camp Trekking route. It is on the banks of the Pinder Ganga. The inhabitants of Khati Village are very hospitable. Today morning trek to Jatoli village. From Khati we will take the route passing through the Pinder River up to Warbham. Warbhum is the confluence of Pinder River and Sunderdhunga stream. Now walking through the Sunderdhunga stream, reach Jatoli. Dinner & overnight stay in camps. Today's trek is 12 km long and it passes through the thick alpine forest for more than half the journey. Today, we will get to see the Saria River. Kathalia is the last inhabited village. Overnight stay in tents. Today we will trek up to Sunderdhunga view point that passes through the Sukhram Cave. This trek is 10 km and it will take around 4-5 hrs to reach over there. On arrival we will pitch tent for dinner and overnight stay. Post breakfast start trekking with a steep climb of 4km to reach Sunderdhunga Base Camp Trek. Once you reach Maiktoli top you would feel like touching the peak. Back to Kathalia for dinner and overnight stay. Today we will trek back to Jatoli. Dinner and night stay in tents. Trekking back to Khati we will set up camp for dinner and overnight stay. Trek back to Dhakuri in the morning. Dinner and overnight stay in tents. Today morning we will trek (13 kms/ 5-6 hrs) followed by a drive to Bageshwar. On arrival check in to hotel for dinner and overnight stay. After breakfast we will drive to Delhi via Kathgodam. Arrival at Delhi by the evening.